That post has shown that Scala.js allows us to write browser apps, but it also demonstrated that these apps can be vulnerable to other ills of frontend programming. To fix this issue we need to simplify our codebase. One way to do that is by adding a binding between the UI and what data our app holds. This way if the data changes in one place it will be automatically propagated to the other. We will implement this using Reactive Extensions. 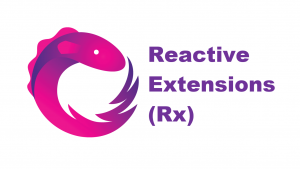 Reactive Extensions (Rx for short) is a library originally introduced by Erik Meijer to the .NET framework. Rx aims to allow the composition of asynchronous and event-based programs using Observables. It might sound confusing at first, but the idea gets intuitive after you try it out. Observable can be seen as a source of events, hence “event-based”. We don’t know when an event might happen, that’s why it’s “asynchronous”. We can observe the source and react on events, thus sources are called Observable. Consider an app that counts the number of clicks on a button. The button will be our Observable and it will emit a “Click” event each time it gets clicked. Using Rx we can create a stream of “Click” events where each will update a counter. 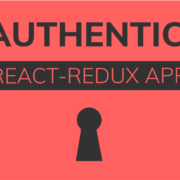 This is the idea behind Reactive Extensions in a nutshell. After being introduced to .NET the idea quickly spread across other languages, including Scala. In our post we will use Scala.Rx created by Li Haoyi. We’ve chosen this implementation as it’s fully compatible with Scala.js. It’s no surprise if you consider that creator of Scala.Rx is also the person behind Scala.js. To simplify our organizer we want to create a graph that will propagate changes in our data from one side of the app to another. We will aim to create a graph as depicted below. It get’s slightly more complicated with other Vars, so let’s define a helper trait. That looks quite complicated at first glance, but really it isn’t. 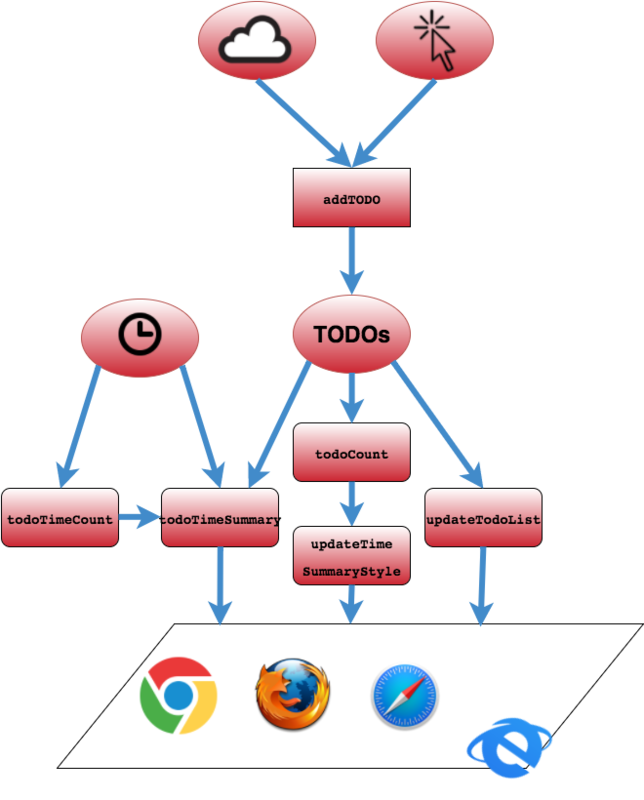 All we do here is create a Var that updates when a browser event happens – interval tick or elements onClick handler. We will put those helpers to good use in our main code. If you compare this new solution with the diagram above, you will find out that they are basically the same. Thanks to Rx we’ve turned a stateful spaghetti code into a simple flow. Neat. What is the difference between Rx and Obs? Rx is a definition that automatically captures Vars and other Rxs in it’s block. When those captured elements change, the capturing block is evaluated again with the new values and the capturing Rx is updated. Obs can be thought as a more advanced Rx. You can do a few more tricks with it – like perform side effects and explicitly define dependencies (which we use in this example). As you can see Rx was immensely useful for reducing boilerplate code and creating a simple flow of values in the system. Reactive Extensions have proven their worth. Creating this bidirectional flow is a step in the right direction – it helped us to manage state. Still when the app grows so does the graph and potentially it may get big and complicated later on. Modern frontend apps deal with this issue by using encapsulated components and unidirectional flows … but it’s something for another post. PS. Special thanks to lihaoyi for creating the great code – Scala.Rx. It wouldn’t be possible without you. [UPDATE] I would like to say sorry to Sébastien Doeraene who is the author of Scala.js and was omitted in these blog posts. Without his hard work Scala.js would not come to life. Thank you Sébastien.